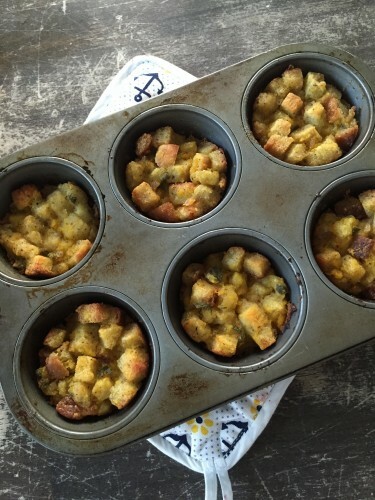 I used to be so intimidated by homemade stuffing but this recipe changed all that. Pumpkin puree helps keep the stuffing moist without all the fat, plus adds a seasonal flavor that can’t be beat. Add this fun and easy recipe to your Thanksgiving table – you can use a muffin pan for easy portion control or make a large casserole instead. Best part is – it has less than 130 calories per serving! Spray a 12-cup muffin pan with cooking spray and set aside. Preheat oven to 350-degrees F.
Melt olive and butter in a medium skillet. Add onion, sage, and thyme; season with salt and peppers and sauté for 3 to 5 minutes, until fragrant and onions are tender. Set aside to cool slightly. In a large bowl, gently mix bread and pumpkin. Add onion and sage mixture and stir well. Add chicken broth ½ cup at a time until mixture is moist (you may only need 1 cup). Transfer stuffing to muffin cups. Cover with foil* and bake for 15 minutes. Remove foil and bake for an additional 15 minutes or until tops are golden brown.